Showing items in category British East Africa, sorted by newest listed first. BRITISH EAST AFRICA - 1898 4a rate cover to Germany used at MOMBASA. 1898 (FE.16.) 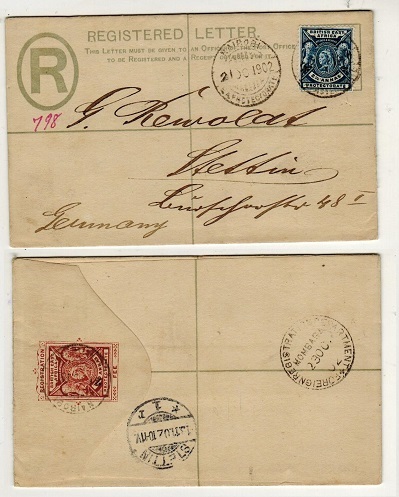 cover addressed to Germany bearing 1/2a (x2), 1a and 2a adhesives each tied by squared circled MOMBASA cancels. ZANZIBAR transit b/s and OPPELIN arrival. BRITISH EAST AFRICA - 1899 1a rate cover to India used at KILINDINI. 1899 (10.5.) 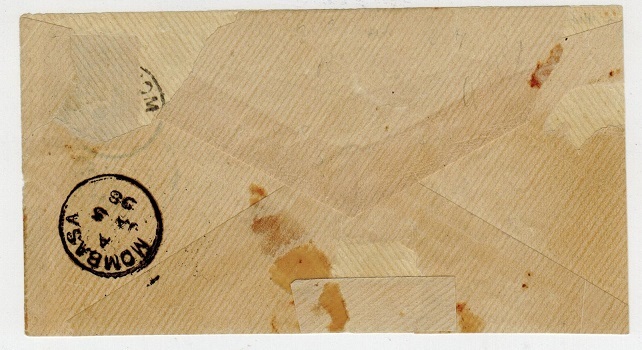 cover addressed to India bearing BEA 1a adhesive (SG 67) tied on reverse flap by squared circle KILINDINI/MOMBASA cds (Proud type D1) with part SEA POST OFFICE transit cds at left and BURDABPUR arrival. BRITISH EAST AFRICA - 1893 1a grey PSC to Germany used at MOMBASA. H&G 2. 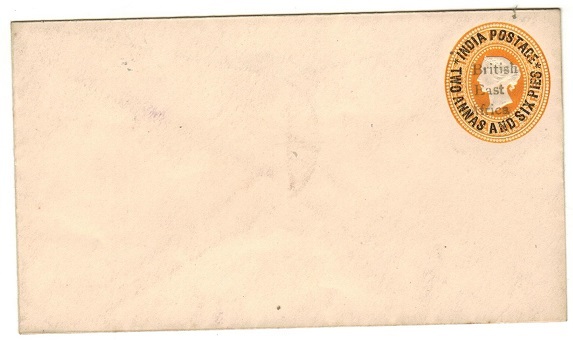 1893 1a grey on cream postal stationery postcard addressed to Germany (long message) cancelled by squared circle MOMBASA cds dated SP.5.93. ADEN transit and DRESDEN arrival cds's. A nice early use of this stationery. H&G 2. 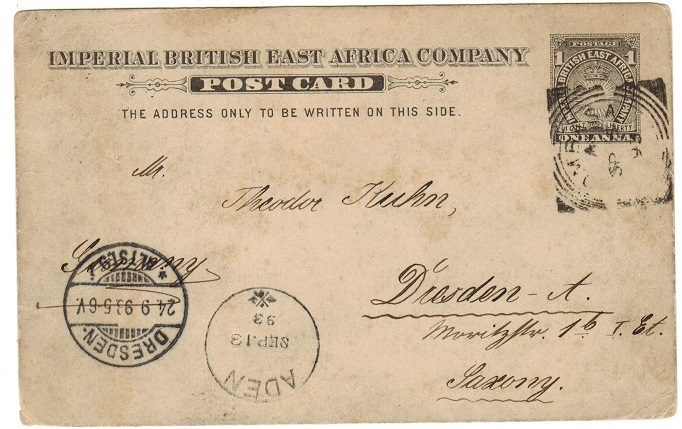 BRITISH EAST AFRICA - 1896 2a red-brown RPSE to Germany uprated at NAIROBI. H&G 4. 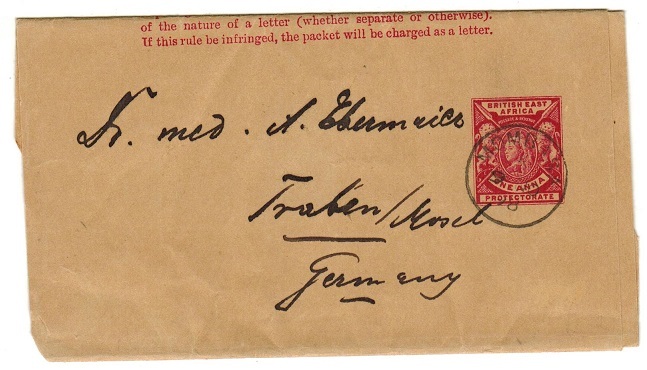 1896 2a red-brown on cream registered postal stationery envelope (size F) addressed to Germany bearing additional 2 1/2a adhesive tied by MOMBASA/E.A.PROTECTORATE cds dated 21.OC.1902. H&G 4. 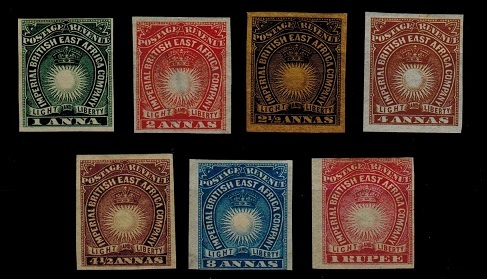 BRITISH EAST AFRICA - 1881-95 range of FOURNIER forged overprint and surcharges. 1881-1895 range of FOURNIER overprint and surcharges printed in black on cream paper affixed to part of the (page 7) of the Fournier handbook showing three types of 'British/East/Africa' an additional strike including 'Half Anna' and another with '4 annas' plus 'British/East Africa/ Company' and '1 anna, 2 1/2, 4 annas and 5 annas' strikes. BRITISH EAST AFRICA - 1897 5r brown JUDICIAL FEE adhesive officially used. 1897 5r brown adhesive overprinted JUDICIAL/FEE in red and cancelled by official violet cancel. Barefoot and Hall 3. Scarce. BRITISH EAST AFRICA - 1891 2a ultramarine RPSE unused. H&G 1a. 1891 2a ultramarine on cream registered postal stationery envelope (size F) in fine unused condition of the scarcer type II issue (64 1/2+66+66mm settings). H&G 1a. BRITISH EAST AFRICA - 1893 2 1/2a green PSE unused. H&G 1. 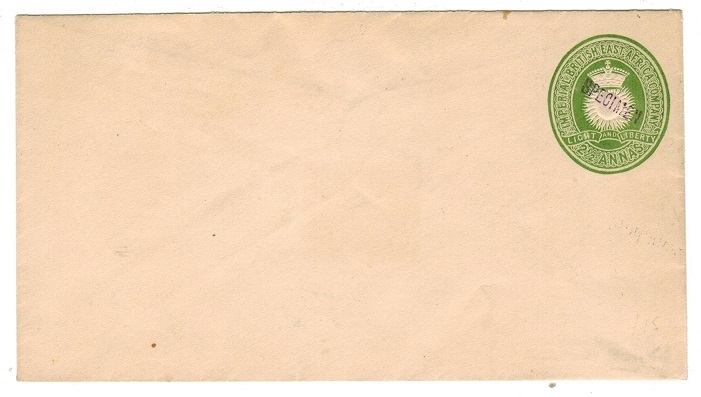 1893 2 1/2a green on white postal stationery envelope (type a) in fine unused condition with Bradbury' imprint under flap. H&G 1. BRITISH EAST AFRICA - 1893 1a grey black PSC unused. H&G 2. 1893 1a grey black on cream postal stationery postcard in fine unused condition. H&G 2. BRITISH EAST AFRICA - 1895 1a on 1 1/2a PSRC unused. H&G 6a. 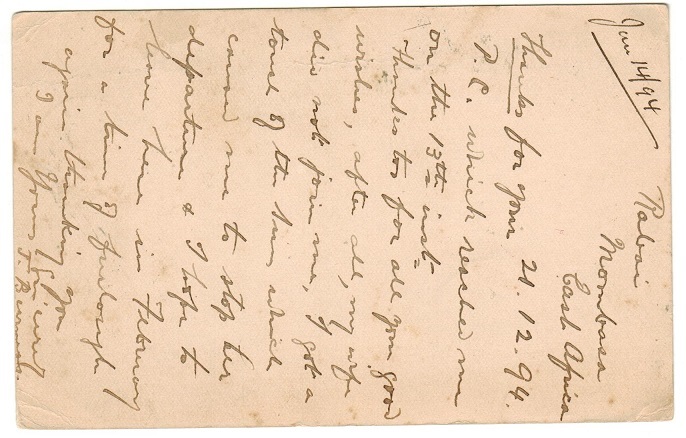 1895 1 anna black on 1 1/2a blue on buff postal stationery reply type postcard on India overprinted BRITISH/EAST/AFRICA in black ink of the type 1 in fine unused condition. H&G 6a. 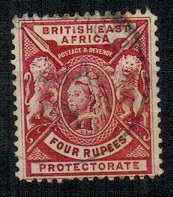 BRITISH EAST AFRICA - 1896 2 1/2a on 4 1/2a orange PSE unused. H&G 3. 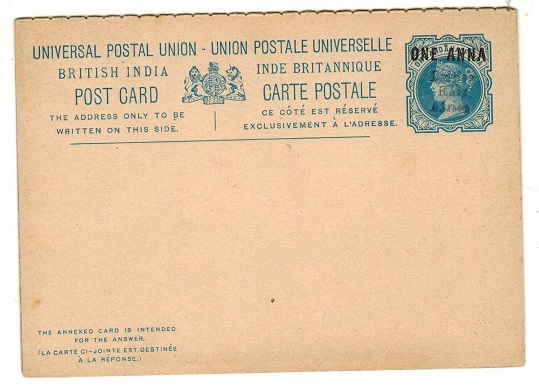 1896 2 1/2a on 4 1/2a yellow-orange on white postal stationery envelope of India overprinted BRITISH/EAST/AFRICA in black (without stop) in fine unused condition. H&G 3. BRITISH EAST AFRICA - 1896 2a blue RPSE unused. H&G 3a. 1896 2a blue on cream registered postal stationery envelope with type II overprint in blue ink (size F) in fine unused condition. H&G 3a. BRITISH EAST AFRICA - 1902 use of 1/2d green PSC to Switzerland (creased) used at KILINDINI. H&G 7. 1902 (JL.4.) 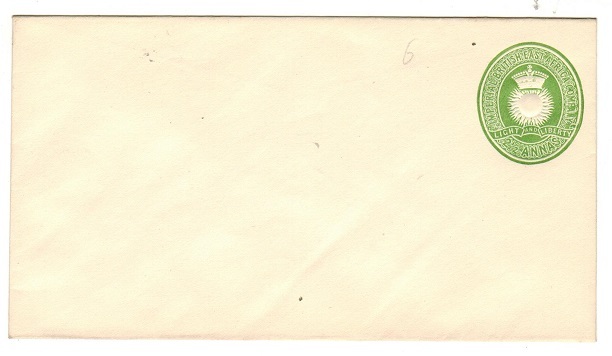 use of 1/2d green on cream postal stationery postcard (H&G 7) addressed to Switzerland and with message on reverse. The card has a heavy vertical crease at left edge but is struck by a fine strike of the KILINDINI/E.A.PROTECTORATE cds. 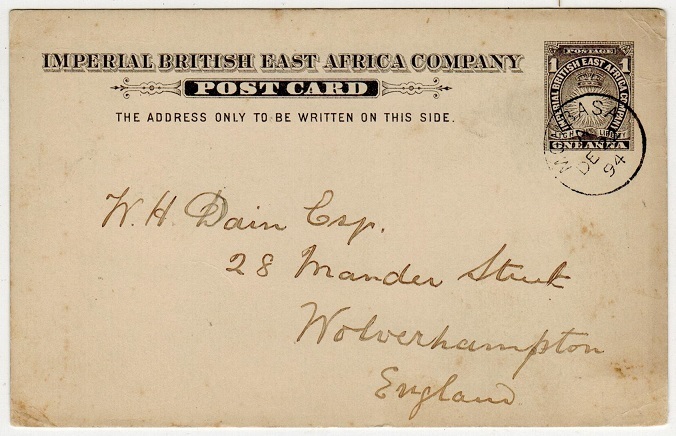 BRITISH EAST AFRICA - 1896 1a carmine postal stationery wrapper to Germany. H&G 4. 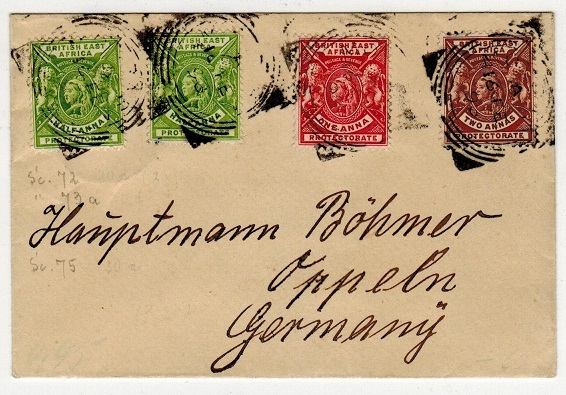 1896 1a carmine on buff postal stationery wrapper addressed to Germany cancelled by MOMBASA s/r cds dated 9.NO.98. H&G 4. 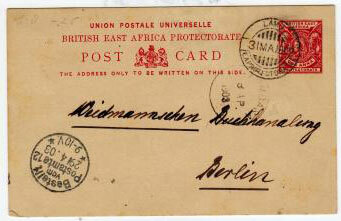 BRITISH EAST AFRICA - 1893 1a PSC written at Rabai and posted at MOMBASA. H&G 2. 1893 1a grey black on cream postal stationery postcard addressed to UK. The card was written from Rabai and cancelled by s/r MOMBASA cds dated DE.22.94. H&G 2. 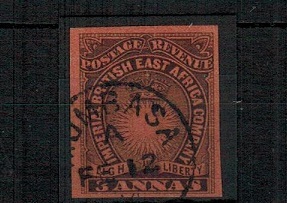 BRITISH EAST AFRICA - 1897 2r orange on piece cancelled MOMBASA. H&G 93. 1897-1903 2r orange on piece cancelled by central MOMBASA cds dated 25.JL.1901. H&G 93. BRITISH EAST AFRICA - 1890 IMPERFORATE single range mint. 1890-95 1a blue green (SG 5), 2a vermilion (SG 6), 2 1/2a black on yellow (SG 7), 4a yellow brown (SG 9), 4 1/2a dull violet (SG 11), 8a blue (SG 12) and 1r carmine (SG 14) all in mint IMPERFORATE singles. 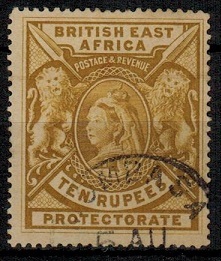 BRITISH EAST AFRICA - 1897 10r yellow-bistre used. SG 97. 1897-1903 10r yellow-bistre cancelled by part MOMBASA cds. Fine condition but somewhat overall lightly toned. SG 97. BRITISH EAST AFRICA - 1893 3a black and red IMPERFORATE single cancelled MOMBASSA. SG 8ab. 1893 3a black on bright red IMPERFORATE single cancelled by MOMBASA s/r cds. SG 8ab. BRITISH EAST AFRICA - 1897 1r grey blue mint. SG 92. 1897-1903 1r grey-blue in fine mint condition with some pink adhesion on reverse from the official inter leaving book to stop the stamps from sticking. SG 92. 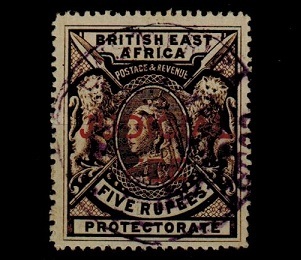 BRITISH EAST AFRICA - 1896 4r carmine lake fine used. SG 78. 1896-1901 4r carmine lake in fine used condition. SG 78. 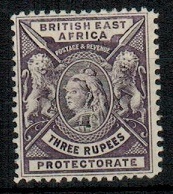 BRITISH EAST AFRICA - 1896 3r deep violet mint. SG 77. 1896-1901 3r deep violet in fine mint condition. SG 77. 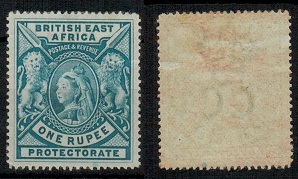 BRITISH EAST AFRICA - 1890 2a,4a,8a and 1r IMPERFORATE singles. 1890-95 2a vermilion, 4a yellow-brown, 8a blue and 1r carmine IMPERFORATE singles on gummed paper with wider margins than possible from a cut down stamp but probably coming from the 'larger type margin' variations as these values are the most difficult 'imperforates' to find. SG 6,9, 12 and 14. 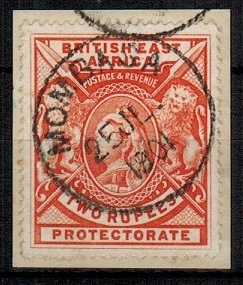 BRITISH EAST AFRICA - 1898 2 1/2a on 1a surcharge adhesive on local cover from MOMBASA. 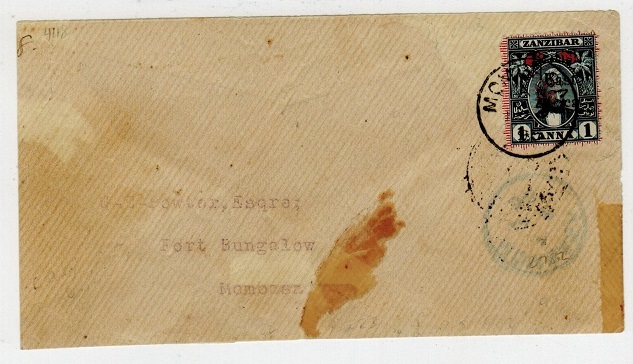 1898 2 1/2a on 1a indigo and red surcharge on locally addressed 'Powter' cover addressed to Fort Bungalow and cancelled by MOMBASA cds dated JA.3.98. The cover is fragile and has faults (small parts of reverse side missing and slightly reduced) but only 1,200 examples of this overprint were printed and the stamp is very rare on cover with only 8 known commercial covers recorded for both values surcharged. 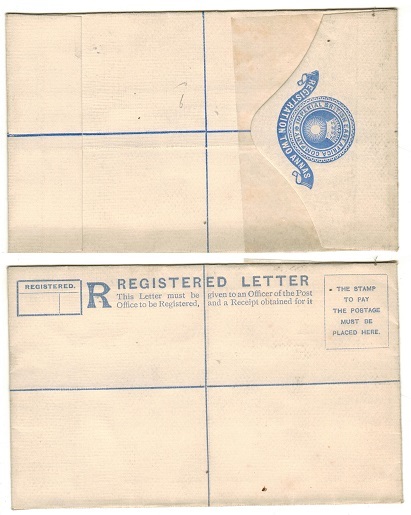 Over franked covers are known but these are normally found addressed to Dewjee Jamall. 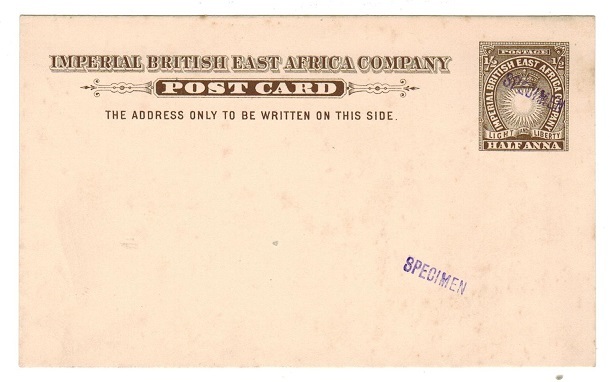 BRITISH EAST AFRICA - 1896 2 1/2a PSE used locally from LAMU. H&G 5. 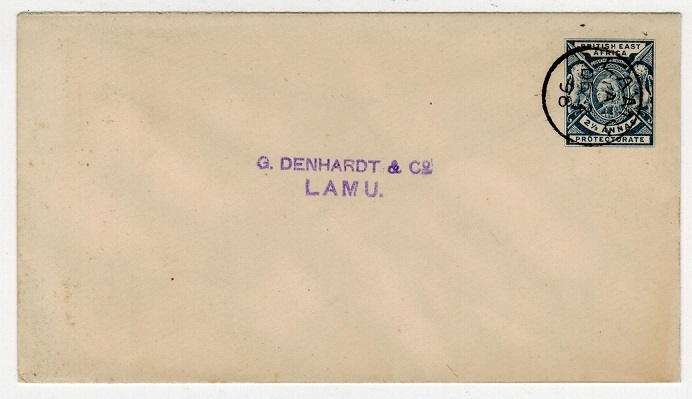 1896 2 1/2a blue on cream postal stationery envelope (size a) addressed to 'G.Denhardt & Co. of Lamu' & cancelled by s/r LAMU cds dated DE.2.98. H&G 5. BRITISH EAST AFRICA - 1893 1/2a brown PSC unused with SPECIMEN h/s. H&G 1. 1893 1/2a brown on cream postal stationery postcard in unused condition handstamped SPECIMEN in violet. H&G 1. BRITISH EAST AFRICA - 1893 2 1/2d PSE unused handstamped SPECIMEN in violet. H&G 1. 1893 2 1/2a green on cream postal stationery envelope (size a) with colourless 'Bradbury Wilkinson' imprint under flap in unused condition handstamped SPECIMEN in violet. Minor fault under flap from slight gum adherence. H&G 1. 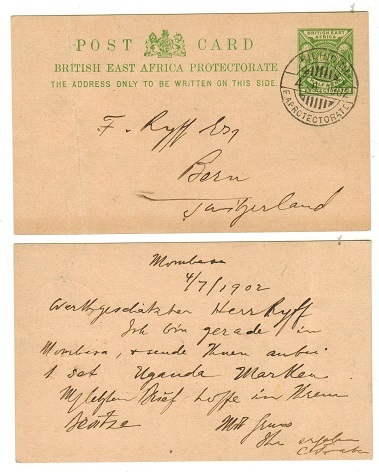 BRITISH EAST AFRICA - 1902 OHMS cover to USA with FOREIGN REGISTRATION DEPARTMENT cancel. 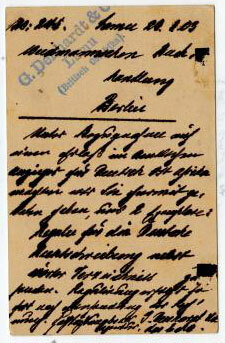 1902 (JE.18.) 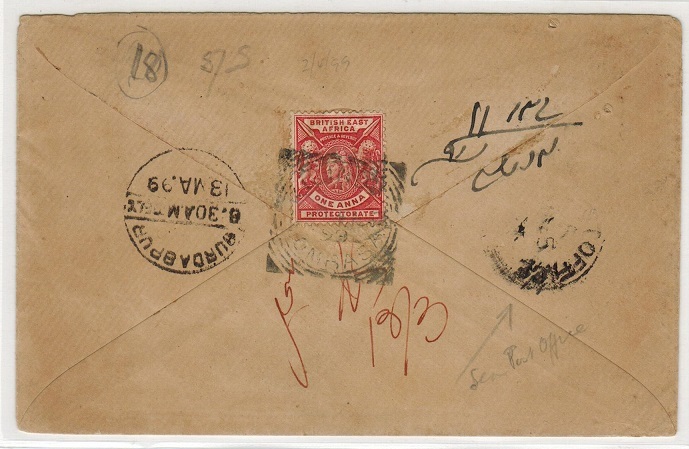 use of long O.H.M.S./EAST AFRICA PROTECTORATE envelope registered to USA (some ageing on reverse and edges of flap missing bearing a fine block of four of the 1a red and single 3a grey adhesives (SG 66+69) tied on the reverse by scarcer FOREIGN REGISTRATION DEPARTMENT/ MOMBASA cds's. (Proud type R4). Scarce official item. 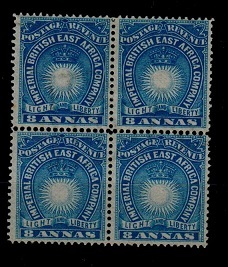 BRITISH EAST AFRICA - 1890 8a blue mint block of four. SG 12. 1890 8a blue in a fine mint block of four on thin paper. Blocks are scarce. SG12. 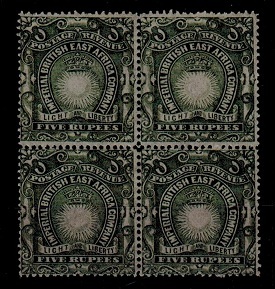 BRITISH EAST AFRICA - 1890 5r grey green FOURNIER mint FORGERY block of four. SG 19. 1890 5r grey-green in a fine mint block of four of the 'Fournier' forgery. SG19. 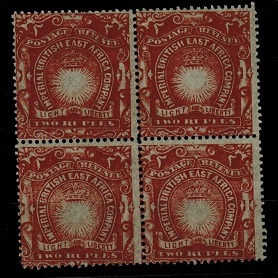 BRITISH EAST AFRICA - 1890 2r brick red FOURNER mint block of four FORGERY. SG 16. 1890 2r brick red in a fine mint block of four of the 'Fournier' forgery. SG16. 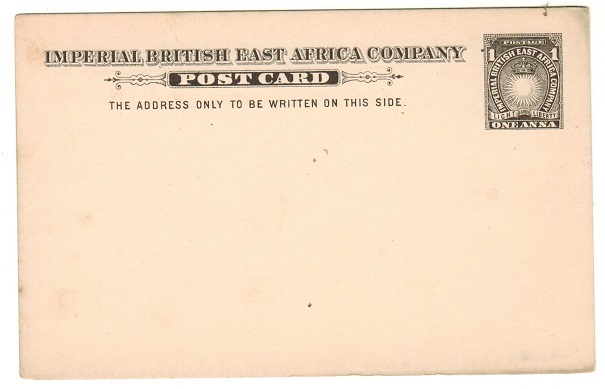 BRITISH EAST AFRICA - 1896 1a PSC used from LAMU. H&G 8. 1896 1a carmine on cream postal stationery postcard addressed to Germany (genuine use) cancelled by LAMU/E.A.PROTECTORATE cds dated 31.MA.1903. MOMBASA transit and BESTELIT arrival cds. H&G 8. BRITISH EAST AFRICA - 1896 1/2a+1/2a PSC SPECIMEN. H&G 9. 1896 1/2a + 1/2a yellow green on buff postal stationery reply type postcard in fine unused condition overprinted SPECIMEN diagonally. H&G 9.